My family and several of my neighbors are very concerned about Walmart moving into the neighborhood and are just as troubled by the way the City of San Jose has essentially steamrolled this project over the public. 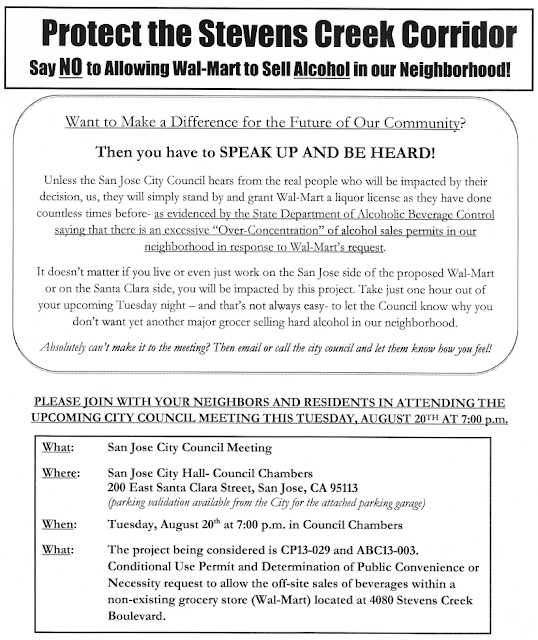 We have submitted a petition with over 100 signatures to the City asking them to deny Walmart their request for a permit for off-site alcohol sales at the proposed site on Stevens Creek Boulevard as we have been told that the City has little discretion over anything else. Right now, there are approximately 50 liquor licenses within a 2 mile radius of the proposed site; Walmart's would be number 51! We also have a fair amount of crime in the area and are concerned about attracting more crime to the area and jeopardizing public safety with off-site sales of alcohol until 12am. Planning staff for the City has been anything but helpful with requests for information. Most recently, the City “accidentally”sent out the public notice for the upcoming Planning Commission and City Council hearings regarding Walmart’s permit requests with the wrong day of the week next to the City Council hearing date on the notice. When we asked planning staff to correct the mistake and resend out the notice so that residents aren’t confused and try to attend the City Council meeting on Wednesday instead of the correct day, Tuesday, August 20th, staff said that because the date was right, they did not have to resend it. When pressed further on it, they agreed only to resend it to people who attended and commented at the initial community meeting that they had quickly noticed about a month ago. Finally, when being told that what they were doing was not legal, staff recanted and said that they would resend a revised Notice out to everyone in a 1,000 foot radius after all. Staff also recently stated that the public request for a traffic study analysis was determined unnecessary because the City determined that the former use of a Circuit City was similar to the proposed traffic that a major grocery store like the proposed Walmart Neighborhood Market would generate. Comparing traffic generated from a failed store selling electronics and desktop computers is a far cry from traffic that will be generated by a major grocery store at the same site, yet the City will not conduct a proper traffic analysis. 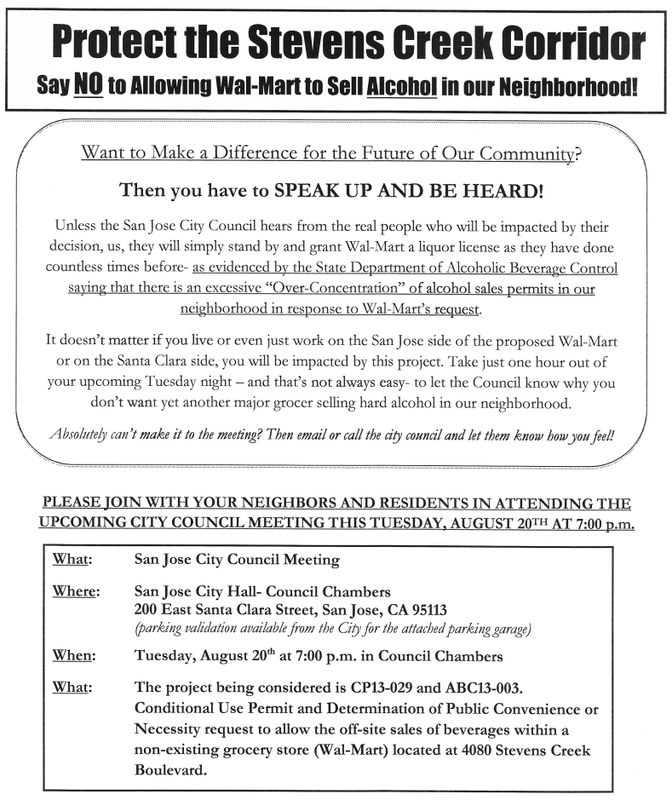 Overall, we just want to get the word out about this project and the upcoming public hearings as the City seems to have already made up their mind about giving Walmart the off-site alcohol sales permit regardless of what the residents who will have to live with the impacts have to think. We appreciate anything you can do to bring light to this project and on what the City is doing. Thank you for your time and consideration." Say "Yes" to abandoned buildings instead of WalMart! My point exactly. If the concern is really crime, then anything is better than a huge empty building that attracts unsavory elements. And the alcohol angle is just ridiculous. WalMart will not significantly increase booze sales in the area. Now if they wanted to push for something more interesting and urban than a WalMart, I might be supportive. If a Whole Foods was planning to move in there, who also sells a full range of alcohol, I'm sure there would be no complaints. Agree that the alcohol angle is ridiculous. If that is truly a valid concern, then they need to focus on the existing liquor stores in the area. San Jose needs tax dollars and grocery store would be a nice fit for that area. Much better than an empty building. The neighborhood should welcome the Walmart store. There is only one decent Safeway at Stevens Creek and Lawrence, with the others on the smaller, even if the Homestead store was remodeled recently. The Pruneridge Lucky's is also outdated. The addition of Walmart to the area will encourage the shopping center owners to remodel and bring in new stores. If these residents are really concerned about traffic and alcohol sales, they should focus on the future development of the Garden City site which will likely increase both. Selling alchol? Like the Safeway down the way and the BevoMo on Stevens Creek in Santa Clara? I wonder how many of those Walmart Neighborhood Markets we need. There's already one just a few minutes away at the Westgate Center. On the other hand this lot has been empty since several years now, so a Walmart might be the best we can get. I was thrilled to see Walmart moving into this building. As it is you have to drive all the way to Milpitas to get to the nearest Walmart. But after finding it is a scaled down neighborhood market I was disappointed. I would love to have a Walmart superstore open in Santa Clara. I welcome that with open arms. This guy should be concerned about "Buddy's" Marijuana shop right next door. Would love to see a Sam's Club at the old Garden City site.